For the linebacker, see Cliff Lewis (linebacker). Lewis attended Lakewood High School in Lakewood, Ohio, and Staunton Military Academy in Virginia. He went to Duke University, where he played football as a back. He was a member of the Duke Blue Devils basketball team during the 1944–1945 season. Lewis joined the Browns after graduating from college and spent his entire professional career with the team, playing primarily as a defensive back. He left the game after the 1951 season to concentrate on his insurance business. Lewis died in 2002. After graduating, Lewis attended Duke University in Durham, North Carolina and played as a back on the school's Blue Devils football team. 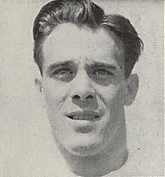 Lewis was Duke's second-string tailback as a sophomore in 1944, but he took over starting duties after the original first-stringer, Allen Elger, suffered a knee injury. Lewis, however, broke his elbow in the team's second game of the season against the University of Pennsylvania and had to sit out. He returned for a November game against the Georgia Tech Yellow Jackets, and in a 34–0 victory on November 11 against the previously undefeated Wake Forest University he passed to receiver Clark Jones for a touchdown. Later in November, he passed to Harold Raether for the final touchdown in a 33-0 win over the University of North Carolina that gave Duke a second consecutive Southern Conference title and a spot in 1944's Sugar Bowl game against the University of Alabama. Lewis's passing helped Duke drive the ball 64 yards in the third quarter against Alabama, leading to a touchdown by All-American Tom Davis. Duke won 29–26. While football was Lewis's main sport, he also played basketball at Duke in the 1944–1945 season. In 1961–62, Lewis worked as a color commentator on Browns television broadcasts, and became vice president of insurance administration for the New York Yankees following the team's purchase by George Steinbrenner in 1973. He participated in the retired players division of the NFL players' golf tournament in Hollywood, Florida, in January 1961. He was inducted into the Greater Cleveland Sports Hall of Fame in 1976. Lewis died at the age of 79 in Tampa, Florida following an extended illness in 2002. 1 2 "Cliff Lewis". Greater Cleveland Sports Hall of Fame. Archived from the original on October 6, 2012. Retrieved August 25, 2012. 1 2 "Ex-Lakewood Athlete Sets Scoring Mark". Cleveland Plain Dealer. December 3, 1942. p. 20. 1 2 "Duke's Long Runs Stop Wake Forest". The New York Times. November 12, 1944. p. 53. Archived from the original on October 6, 2012. Retrieved August 4, 2012. 1 2 "Expect Clark To Pace Duke". St. Joseph Gazette. Durham, North Carolina. Associated Press. December 30, 1944. p. 5. Retrieved August 4, 2012. ↑ "Lewis Returns to Duke Squad". The New York Times. November 2, 1944. p. 24. ↑ "Duke Overpowers No. Carolina, 33-0". The New York Times. November 26, 1944. p. 54. Archived from the original on October 6, 2012. Retrieved August 4, 2012. ↑ "Duke's Power Beats Ala. Air Attack 29-26". Schenectady Gazette. New Orleans. Associated Press. January 2, 1945. p. 11. Retrieved August 4, 2012. ↑ "Penn Easily Beats Princeton, 66 to 52". The New York Times. February 11, 1945. p. 51. ↑ "Triple-Threat Star". Los Angeles Times. December 4, 1945. p. A8. ↑ "The Hyland Fling". Los Angeles Times. December 4, 1945. p. A8. 1 2 "Mutryn, Kolesar and Cliff Lewis Are Signed by Cleveland Browns". Cleveland Plain Dealer. February 19, 1946. p. 18. Lewis, 22, is a product of Lakewood High, and at Duke was an outstanding back who sparked the Blue Devils' 29-to-26 victory over Alabama in the 1945 Sugar Bowl game at New Orleans. Last season, in the Navy, he was a member of the crack Fleet City (Cal.) Bluejackets who won the national service title. ↑ "Rams Lose Two Draftees". Los Angeles Times. May 28, 1946. p. A7. ↑ Piascik 2007, pp. 48–49. ↑ Piascik 2007, pp. 64–65. ↑ "Rams Whip Browns, 24-17; Win Pro Title". Los Angeles Times. December 24, 1951. p. C1. ↑ "Browns' Quarterback Quits". The New York Times. July 31, 1952. p. 19. ↑ "National Football Loop Players Keep Miller as Their Attorney". The New York Times. January 5, 1961. p. 36. ↑ "Lewis was first QB to play for Browns". ESPN Classic. SportsTicker. July 25, 2002. Archived from the original on October 6, 2012. Retrieved August 5, 2012.